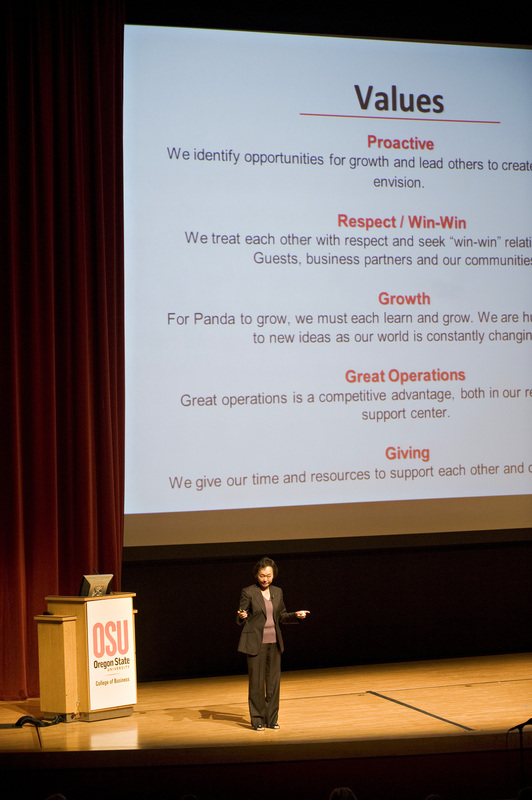 Panda Express co-CEO and Oregon State alumna Peggy Cherng let the crowd at the Oregon State College of Business Dean’s Distinguished Lecture in on a little secret Wednesday. “I happen to be good in math, good in engineering, but I don’t really know how to cook,” Cherng said. Cherng discussed how the Panda Restaurant group, which operates the popular Panda Express chain, focuses on creating an atmosphere where associates can grow and better serve guests. Panda focuses on fostering a culture that creates happy associates, which becomes happy guests. The chain has more than 1,500 locations, opening 100 new stores this past year. With such a wide network, the company encourages decentralized learning, where associates take initiative to learn on their own with resources from Panda. After her talk, Cherng sat down for a question and answer session with OSU associate professor of management Pauline Schilpzand and then took questions from the audience. 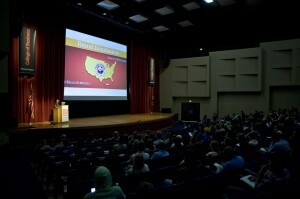 Schilpzand asked why those of us in Oregon haven’t seen many Panda Express television commercials. Cherng explained Oregon is still an emerging market for Panda, and the company focuses larger ad buys in their core markets, such as California. Schilpzand also asked Cherng about what she’s used from her academic background in her career. Cherng earned a B.S. in applied mathematics from OSU and an M.S. in Computer Science and doctoral degree in electrical engineering from the University of Missouri. Cherng mentioned that while she never learned much about food herself — husband Andrew Cherng started the original Panda Inn with his father and now serves as co-CEO with his wife — she has a passion for systems, honed by her training as an engineer. She stressed that passion is a key for all entrepreneurs, no matter what industry one may be entering. I have some questions I would like to ask. 1. What are panda’s goals? 2. Who are the Stakeholders panda deals with primarily? 3. What Competitive advantage does panda have over other companies? 4. What is panda’s Strategy for the near future? 5. What life cycle is the panda in now? 6. what kind of Dimension is panda built like?